Baked Artichoke Bites: 28 Days of Super Bowl Recipes Guest post over on SB Nation today. Talking Super Bowl Burritos! Over the summer, Bryan and I had a chance to take a couple of weeks off to take a road trip across the country. See some friends and family, go to a ballgame, stop by Steelers training camp in Latrobe, have some sweet tea in Tennessee. Obviously having a lot of time in the car, I started to toss around ideas for the 2010-2011 season of the Football Foodie series with both Bryan and with my readers on Twitter. I don’t quite remember how it came up, but somehow we got stuck on Buffalo-style pierogies and how could you do them aside of the usual way of just putting hot sauce on a box of Mrs. T’s. Someone suggested chicken, which I rejected even though I know a few cooks make pierogies with poultry in them. Beef or pork is a common filling in Eastern European pierogies, but chicken? I wasn’t convinced. Then I asked, “What about blue cheese pierogies in a hot sauce?” The gauntlet had been thrown. Both my friends’ and the Twitter reactions were off the charts, so I knew I had to experiment and come up with a recipe that really worked as not to let my readers and my friends who eat at our place on game days down. The Steelers having this week’s Monday Night Football stage gave me all day to make the most powerful lucky dish known to Western Pennsylvania (outside of Dan Bylsma’s lucky burrito); pierogies. Pierogies may be one of the few dishes to be featured on both bar and church fundraiser menus alike around Pittsburgh. There are dozens of filling options and many secrets shared on how to make the pasta part just right. Some people fry them. Some people boil them. 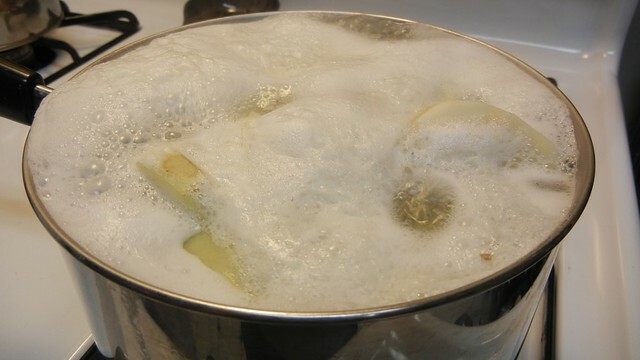 Some boil and then sauté their pierogies. (My preferred method of making pierogies.) Served with sour cream or farmer’s cheese. There are few things more Pittsburgh than pierogies. Did I have a Polish or Russian Nana? No. Did I still have pierogies for dinner at least every other week growing up? Absolutely. Why are pierogies a great football food? Hearty and carb-y enough to soak up extra beer in your stomach. If they’re fried they are just as good — if not better — than any other bar food, an easy snack you can grab and stuff in your mouth without having to look away from the television. They even look like little footballs if you squint hard enough. 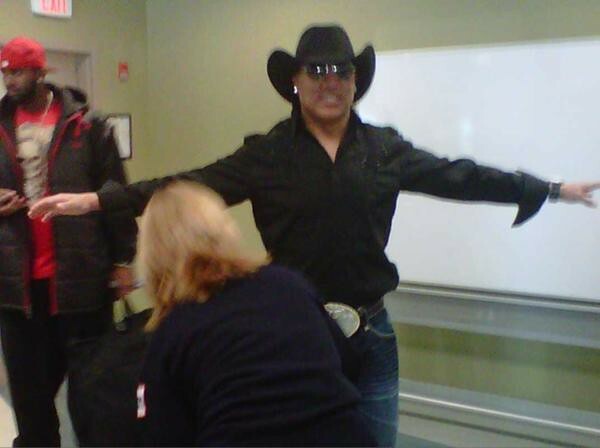 This new variation? These might be my favorite pierogies yet. Tender noodle dough stuffed with potatoes and not just with blue cheese, but also with creamy Monterey Jack to smooth out the starchy spuds and the sharp blue, with just a hint of garlic to highlight all the other flavors. You can make these any night this week, freeze them and be ready to go come Sunday without a sweat. 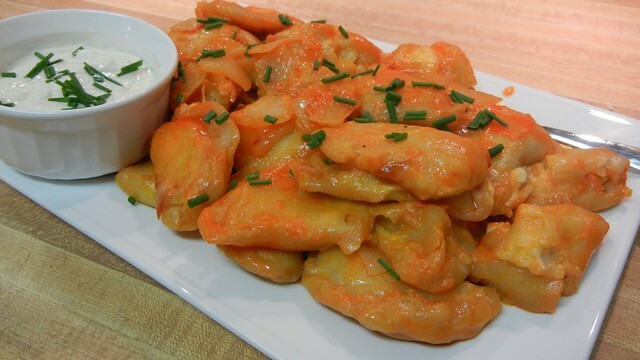 Sautéed in butter with onions and hot sauce, you’ve got the perfect Buffalo-style pierogi. Sour cream and blue cheese dressing for serving. Note: This recipe makes what feels like approximately 10,000 pierogies while you’re standing there filling them, but is more like 110-120 depending how good you are at rolling out your dough thinly and not over-stuffing them. 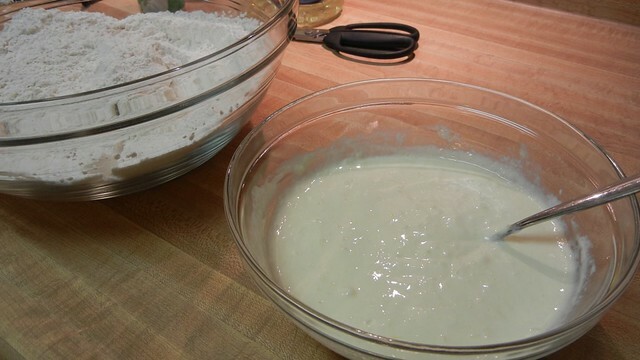 Because it’s a lot of dough to handle all at once, I’ve found that making the dough is much easier if I make half of it at a time, so the pictures below are for just half of the batch of dough. The pictures of the finished pierogies are about 1/3 of the pierogi recipe. But don’t be afraid to make that many pierogies or even half that number of the dumpling treats. They freeze superbly, heck I freeze them for a few hours even when making them fresh for better sautéing, so if you’re going to go through all the effort of making pierogies, just know you’ll be rewarded with enough pierogies not just to get you through the Super Bowl, but probably the NBA All-Star break, if not through all of spring training. 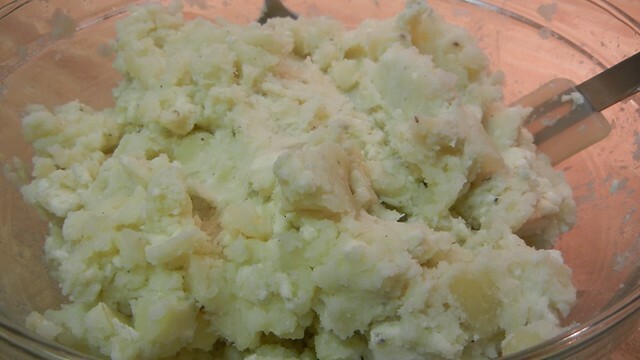 Wash, peel and boil the potatoes like you would for mashed potatoes. Once tender, drain completely and set aside to cool. While the potatoes are cooking, combine the flour and the salt in a very large bowl and the eggs, egg whites, sour cream and melted butter in a smaller bowl. Whisk the wet ingredients together until completely blended. 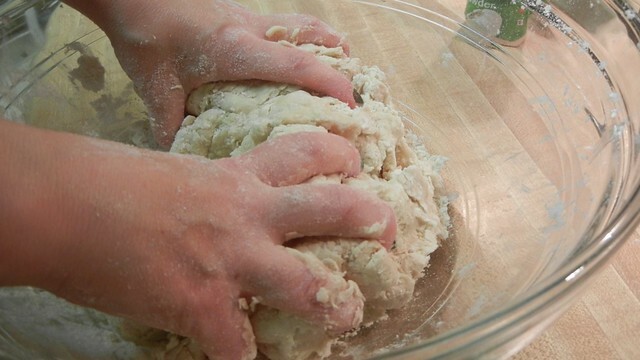 Slowly incorporate your wet ingredients with your dry dough ingredients and knead together. As noted earlier, the dough will be very sticky, so coat your hands with about a teaspoon or so of vegetable oil at first for easier kneading. Form into four equal sized balls, cover with plastic and set to rest in the refrigerator for at least 15-20 minutes, which should be the amount of time it takes to get your filling ready. 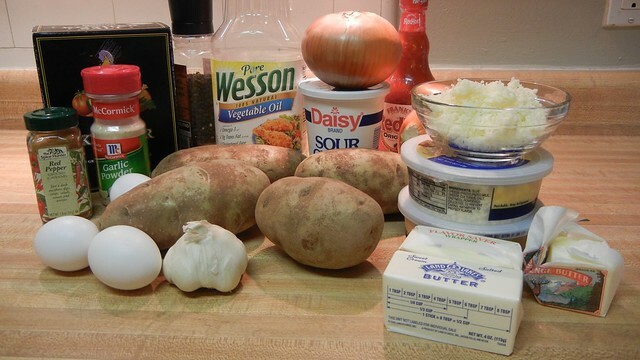 In a medium bowl, combine the cooked potatoes (which should be very crumbly and break apart easily), the blue cheese, the Monterey Jack, garlic powder, salt and ground pepper. There are two ways you can make the individual pierogies. You can roll out your dough into one large sheet and then cut out a 2 – 4 inch round with a cookie cutter or biscuit cutter. I think this can be rather time consuming down the road as you have to re-roll the dough scraps out several times, making the dough tougher each time you work with it. Plus, you have a perfectly round shape to fill and then fold over into the dumpling, which I’ve always struggled to seal when made this way. 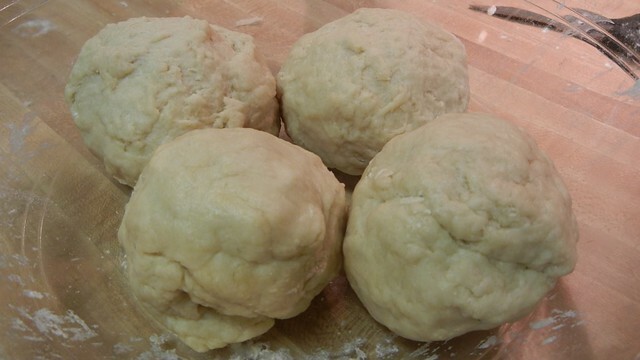 I prefer to roll each ball of dough into a log about an 1 1/2 – 2 inches diameter, cut off about 1/4 to 1/2 of an inch at a time and roll each piece out into a small oval shape with a rolling pin. I’ve found the oval shape easier to fold over the potato mixture. Either way, you’re going to be standing there for a while making pierogies. Fill each one with about a teaspoon or so of the potato mixture and fold over, crimping the sides and the dough completely together. 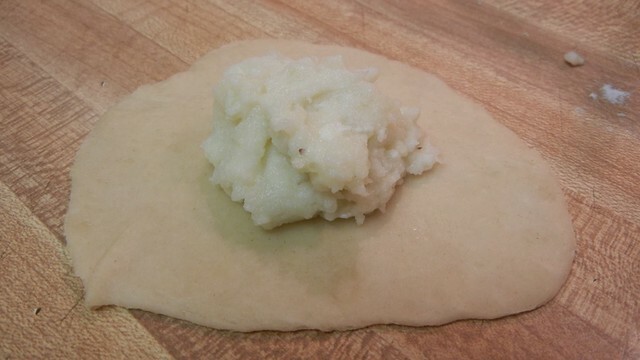 Some people use a fork to seal their pierogies, but I like pushing the dough together with my fingers and rolling down a bit, much like you would an empanada. 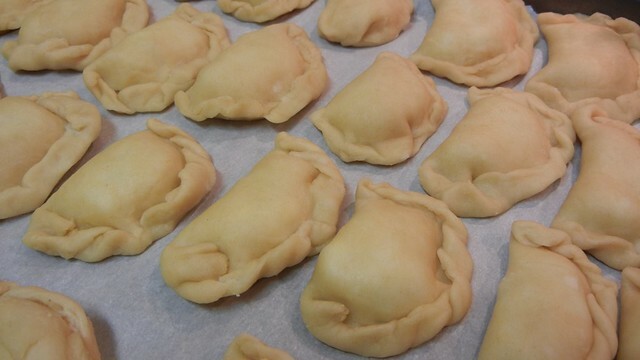 As you make the individual pierogies, set on a lined baking sheet and flash freeze for at least 30-45 minutes so they’re firm enough for either cooking right away or storing without sticking to each other once put into a freezer bag. 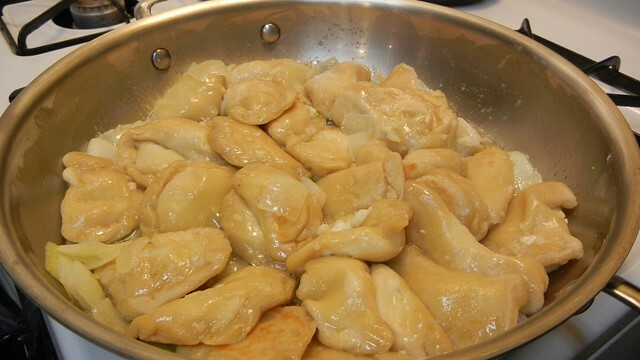 I usually make my pierogies the night before and freeze all of them at once, that way I get much more even results when heating in the pan the next day. If cooking frozen pierogies, sauté over medium heat with butter, chopped onions and garlic all at the same time. 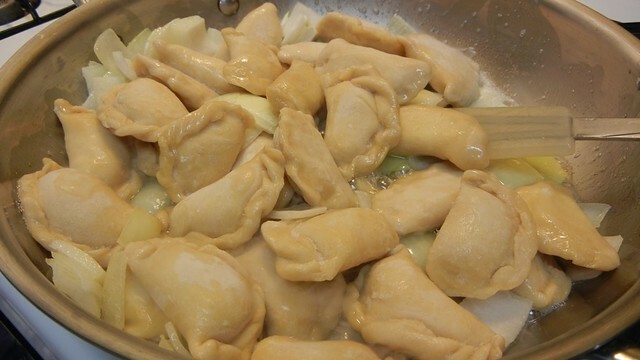 If the pierogies have just been made and are not completely frozen, cook down the onions and the garlic first, then add the pierogies as not to overheat them and cause all the fillings to burst out the sides. Cook until the onions are just starting to turn translucent and the pierogies start to crisp and brown, about 5-7 minutes. 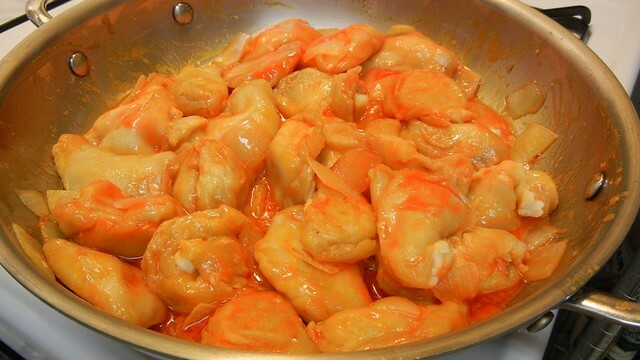 Pour in the desired amount of hot sauce and a pinch of cayenne pepper, toss with the pierogies and keep cooking over medium-low for a couple of more minutes. Serve with blue cheese or sour cream. The heat from the hot sauce and the creaminess of the pasta, potatoes and cheese is perfect match. Buffalo without having to deal with messy wings. Did I mention I made these during the AFC Championship game? That they could be the lucky pierogi? They could be. At least lucky enough for all my guests to inhale during the first half while the Steelers stopped the Jets dead in their tracks. If making your own blue cheese pierogies sounds a little too daunting, Sara Moulton’s baked Buffalo Pierogies recipe is a quick and easy alternative. 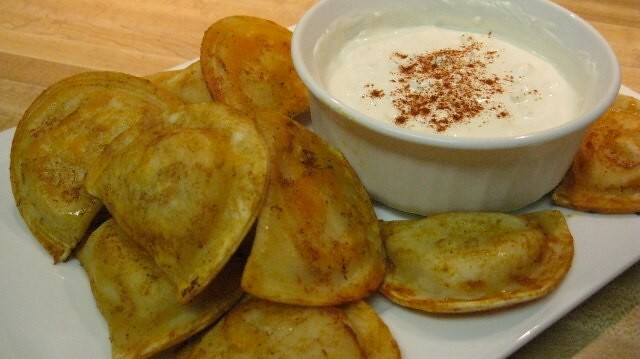 Toss your favorite frozen pierogies in about a tablespoon and a half of hot sauce, tablespoon of vegetable oil or melted butter, a pinch of chili powder or cayenne pepper and bake at 400º for 20 minutes, turning halfway through. 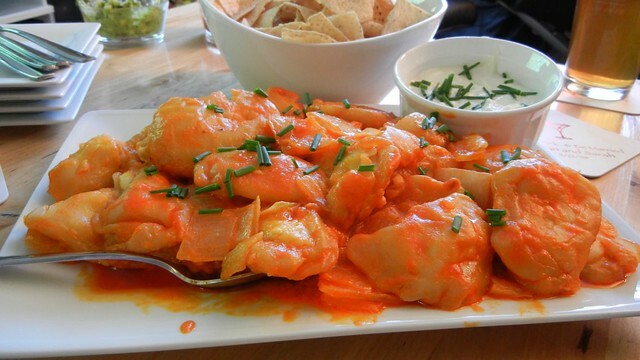 It’s a Buffalo pierogi, but not the Blue Cheese Pierogi in Buffalo Sauce. Steelers photo via One For The Other Thumb. And if you’re questioning how the cooked pierogies will re-heat the next day, have no fear. They are still TOTALLY INCREDIBLE and very spicy. I also recommend drinking a light-colored beer with them, because like any good Pittsburgher food, it’s always enhanced by beer.